To keep busy, I’ve been improving resumes for friends, family and fellow job-seekers on both LinkedIn and JobAngels.com. 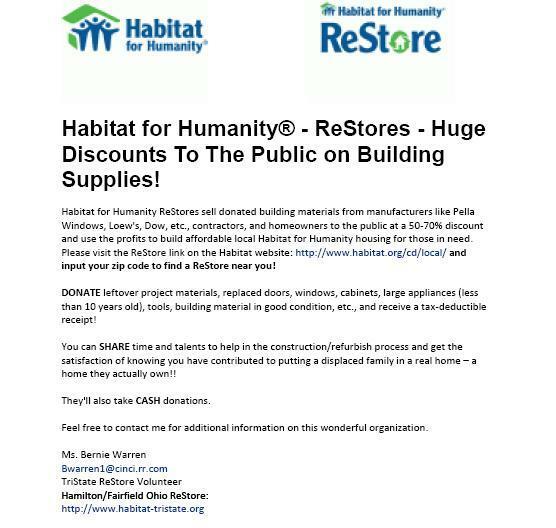 I am an avid advocate for increasing the visibility of Habitat for Humanity Restores - they sell donated construction materials whose proceeds go toward building homes for the less fortunate; www.habitat.org. 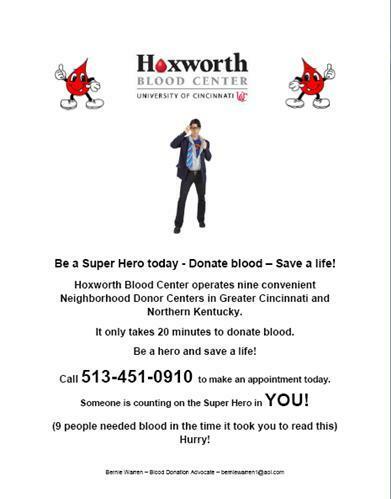 I also promote blood donations for the national Red Cross (1-800-448-3543) and the local Hoxworth Blood Centers (513-451-0951) in Cincinnati. You too can be a hero and save a life by donating blood! Call and make your appointment today. 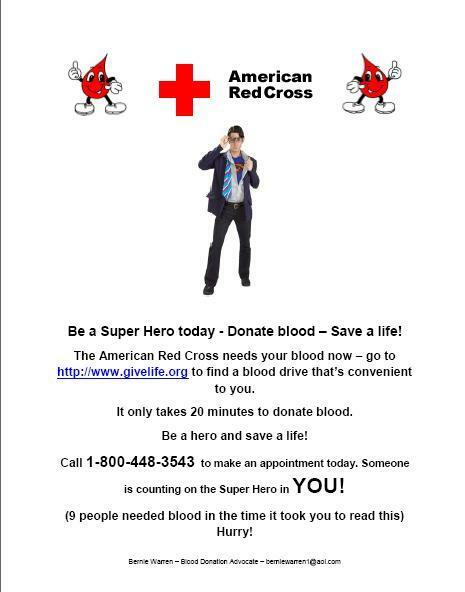 Someone is counting on the Super Hero in YOU! Download my flyers and ask storeowners to display them in their windows to gain visibility for the cause! I enjoy reading, gardening, movies, music, kite flying (try it - it sets you free! ), and bowling. • Developed, launched, and managed a quality audit process for field applicators which saved an estimated $20,000 in unnecessary warranty claims. .• Negotiated multiple reductions in vendor pricing resulting in a yearly savings exceeding $30,000. A consummate and discreet office professional with multi-functional experience in purchasing, vendor negotiation, customer service, office management, inventory control, people management, human resources, and logistics. I am motivated, disciplined, and focused - always striving to exceed expectations. I bring a genuine customer-oriented perspective with me; to be proactive rather than reactive and to treat co-workers, customers, and vendors the way I would like to be treated - with courtesy and respect; it's my personal credo! I always go above and beyond the call of duty to get what is needed - when it is needed - then, and only then, do I feel I have done my job completely! Vendor Negotiations & Purchasing • Performance & Process Improvement • Executive Administrative Assistant • Customer Serv. Mgmt. • Inventory Mgmt. • Office Mgmt • Organization • Billing & Budget Mgmt • Training & Meeting Facilitator • Internet Savvy • Communications • Travel & Event Planning Computer proficient; AS400/SAP, GoldMine, SalesLogix, Outlook, Word, Excel, PowerPoint, CRM, light QuickBooks, Certified Webmaster and a quick study with new software. Conceive marketing themes and design websites with Front Page 2000 and HTML. • Purchase raw materials and various outside services (heat treating, foam filling, and special tread applications) for the manufacture of this 108 year old company’s wheels and casters. • Direct the company's weekly truck routing. • Back up the office manager in making bank deposits, payments, invoicing, applying cash, and other accounting activities in a Visual Manufacturing System. • In charge of credit and collections and have been successful in bringing in debts over 120 days old in excess of $500,000 in my first year. • I also am to "go to" person for unraveling/solving purchase order mysteries and insuring product gets delivered to Hamilton Caster on time in order to ship "Pronto" to customers. • In charge of all inbound vendor shipments providing daily support to vendors shipping product into Hamilton Caster. • Negotiate, bid and manage inbound 3PL contracts to insure the most cost effective and reliable transportation. Provided comprehensive administrative, office, purchasing and pricing support to the VP of Operations. Managed all vendors, contracts, negotiations, and purchasing of chemicals, raw materials, office supplies and equipment. Composed all company correspondence, provided all travel arrangements, event planning, hotel arrangements, delivered prompt, accurate, and proactive national customer service. Coordinated all trucking, logistics, and third party warehousing resulting in significant cost savings. Provided all facets of administration, i.e., operation of the production, manufacturing, and pricing of Novaflow management system. Processed customer orders and entered complicated production records into the Management System to ensure 100% accuracy of batch integrity system. Audited and entered invoices into QuickBooks Pro, provided daily inventory reporting, assisted with special projects, budget tracking, and provided backup for shipping. Resolved all invoice discrepancies to the benefit of the company. Negotiated a reduction in logistics partners shipping rates by 11% realizing an estimated $10,000 yearly transportation cost savings. Provided comprehensive administrative support to the VP of Sales and 8 other sales associates. Managed the office to ensure complete day-to-day functioning, including purchasing of all branch supplies, software and negotiating with all vendors to achieve best prices and service. Directed branch human resource activities for 16 team members including scheduling interviews, call-backs, maintaining database, pre-employment testing, on-boarding and training new hires. Managed all aspects of the rental and running of the company's training room including setting up and servicing clients/students during classes. Recorded branch expenditures and input customer information, sales leads, and sales activity into Microsoft CRM. Prepared, placed, and tracked all company and customer orders and quotes and provided travel arrangements for entire company negotiating special rates for long term stays 100% of the time. Provided expert level of customer service and support to both internal and external customers. Coordinated marketing materials, displays, signage, customer, and company marketing and special event planning always staying within budget. Developed and implemented multiple procedures and processes improving sales team member productivity by 12%. Reconciled expenses and expenditures to purchase orders, prepared and audited expense reports, approved and issued invoices in Microsoft Great Plains accounting software. Provided comprehensive administrative support to the VP of Sales and 3 other sales associates. Purchased and managed inventory at plant and shipping facility in Michigan. Devised numerous process improvements to advance operational efficiencies. Maintained MS Access database of consumer warranty files and supervised entire warranty mitigation process with homeowners. Oversaw receivables, managed the credit process, collections, and dunning as required; never having a bad debt. Designed field applicator operational and procedure manuals that had not existed previously and trained a total of 25 new customers on administrative and consumer warranty reporting processes. Assisted in the development of marketing materials; coordinated customer, marketing, trade show, and company special event planning always staying within budget. Hands on manager of Customer Service/Inventory Control, and 15 public warehouse locations to ensure highest levels of service and the most accurate inventory reporting; delegating work and responsibility as needed. Selected, trained, and managed a staff of 8 CSR's and 3 inventory associates in a fast-paced, homegrown call center; 5,000 customers/60,000 orders per year. Successfully handled a national 30M case inventory at 15 locations within a .012% variance. Insured a $3.5million dollar yearly warehousing budget was never exceeded.